United Airlines is under fire after a dog died in an overhead bin on a flight Monday, and it turns out it has a high rate of pet deaths. More pets have died on United Airlines flights than any other U.S. airline for three years straight. And last year, the airline had three times as many pets die on its flights than all other U.S. carriers combined. So says the U.S. Department of Transportation. To be fair, United is also the largest transporter of animals among U.S. carriers. Still, it had the highest rate of pet deaths in two of the last three years. Just Monday, a French bulldog died on a flight from Houston to New York after a flight attendant told a passenger the dog had to fly in the overhead bin. 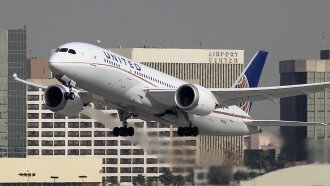 United said in a statement the flight attendant did not knowingly put a dog in the overhead bin and that she didn't understand or hear the pet's owner when they told her their dog was inside the carrier. United has taken responsibility for that dog's death and says it shouldn't have been in the overhead bin in the first place. On Wednesday, Sen. John Kennedy of Louisiana said he wants answers about what happened. "I wrote the president and asked him to explain — the president of United — and asked him to explain, that this has happened on more than one occasion, and then oftentimes it seems to happen on United flights, and they have some explaining to do," Kennedy told reporters. United says to prevent something like this from happening again, it will give bright tags to passengers with in-cabin pets.